My second project was, again, a table. This particular table had lived most of its life at my family’s cottage, and had consequently taken a bit of a beating from the elements. The legs were rusty and housed a good number of spiders, and the top was, well, the top was just plain ugly. In his travels, my dad had found a piece of glass that was the perfect size to replace the existing top. Voila! I was in business! Since I was still in school at the time, the piece took a while – I worked at it when I was bored and/or fed up with reading, writing, or arithmetic (I was a stats TA at the time, so yes, this last one holds true). The first bit I glued down was the swirly burst-like thingy that’s slightly offset from the middle, and after that the table just kind of developed on its own. Grouting was, again, not fun, especially because the table didn’t have a lip around the edge. It would seem that I have not yet learned my lesson, as many of my projects since then have been done on lipless bases – I must be a glutton for punishment. Once my partner and I moved in together, we seemed to have a bit of an over-abundance of coffee tables (3 in a 1-bedroom apartment is a bit excessive), but I still can’t bring myself to get rid of this one. 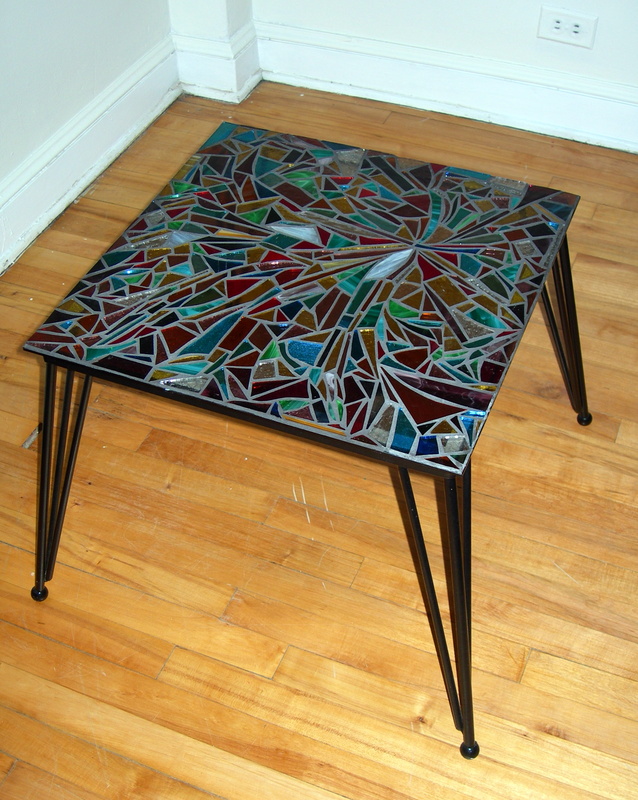 I like the way the light passes through this table, kind of like a stained glass window only more practical, because you can put magazines and coffee mugs on it.